The temperatures are dropping here in our end of the world, looks like Winter is just around the corner. Chilly weather calls for warm comfort food, which make you feel good from within and keeps you full. On one such chilly evening, I made Moong Dal Upma. It needs a little bit of prepping ahead of time, but once that’s done it comes together fairly quickly. Soak moong dal and urad dal in water for 2 hours. Rinse well, drain and then grind to a chunky paste using water as required – the dals must be broken and the paste should be grainy. The batter should be of pourable consistency but thick like idli batter. Pour batter into greased idli plates and steam for 8 minutes until the ‘idlis’ are done. Remove from plates and let cool completely. Once cooled, break the idlis between your fingers. Heat oil in a pan. Add the mustard seeds and when they begin to splutter add the urad and chana dal. Add the curry leaves and green chillies. Saute for a few seconds and then add the chopped onions. Saute until soft, now add the powdered idlis. Also add the grated coconut and combine well. Season with salt. Cook on low heat for 5 minutes. Add lemon juice. Serve while still hot. 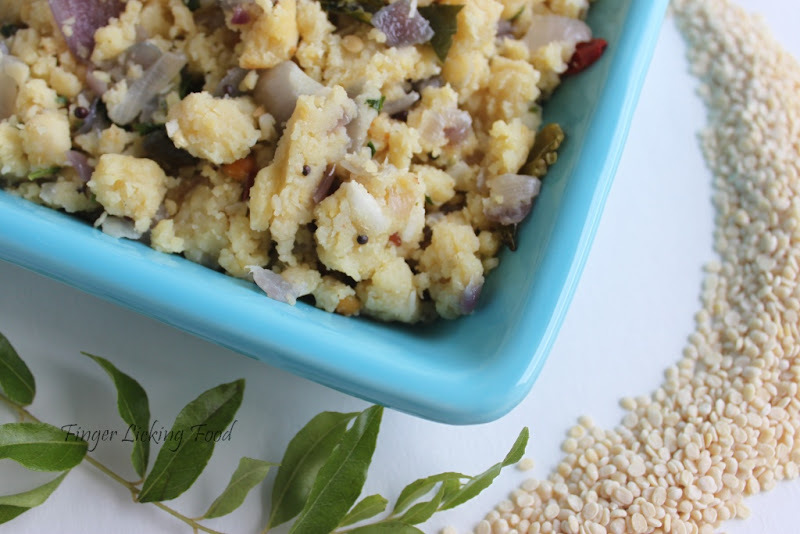 Very interesting and new upma for me.. 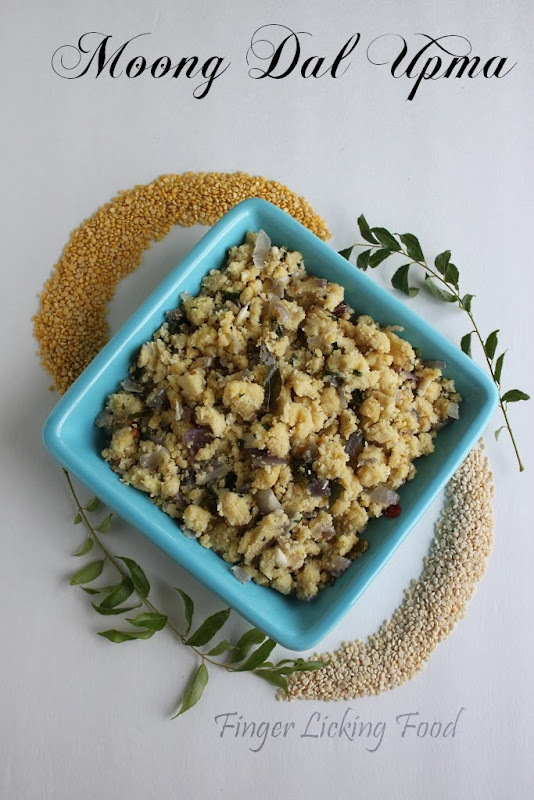 Delicious and healthy upam..urad dal and mong dal sounds so good and flavorful. 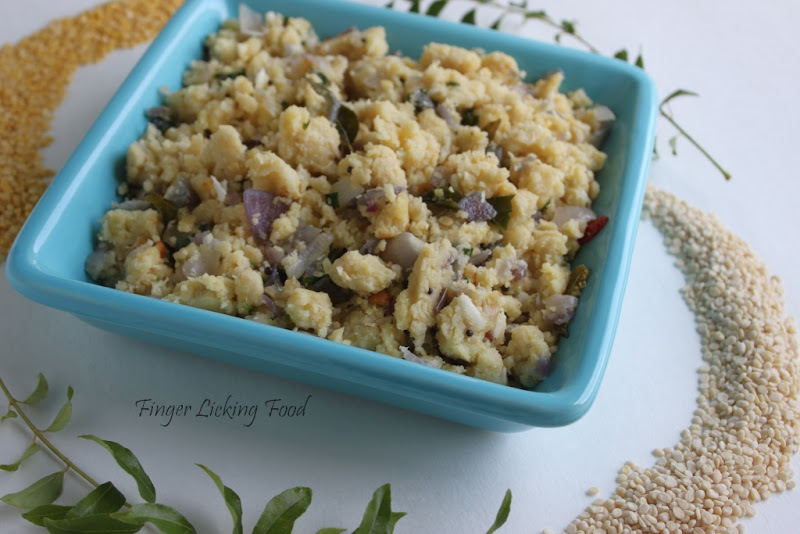 Moong dal upma is a new recipe to me. Looks really delicious. Interesting recipe.. let me try this over the weekend. Happy diwali to you and your family.